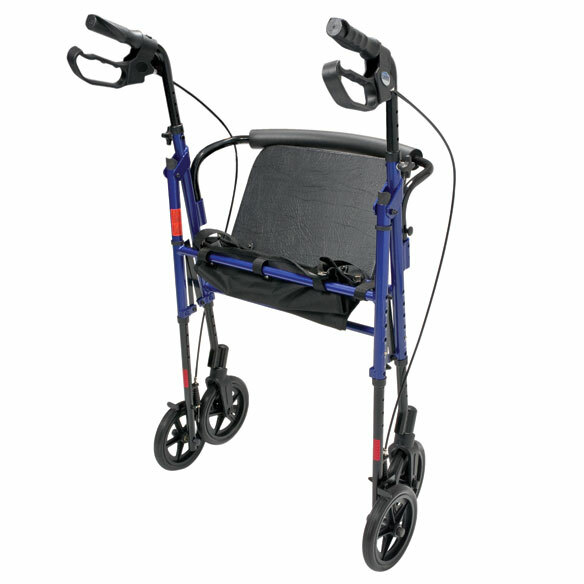 Wide height-adjustable rollator is ideal for those who need a little more room on the go. The wide, padded seat easily adjusts from 19 1/2"H–23 1/2"H in 1" increments, offering users of any height a comfortable place to rest. Smooth-rolling, 7 1/2" dia. rubber wheels are ideal indoors or out. Ergonomic hand grips are spaced 19" apart and feature locking, quick-stop loop brakes. Lightweight aluminum rollator walker is easy to store and transport and features an easy-release removable padded back bar. Wheeled walker includes bonus zip-close, under-seat storage pouch. Choose from 3 colors: blue, burgundy, silver. Handles adjust from 32"H – 38"H.
Walker with seat measures 27"W overall. 27 1/2"D – 31 1/2"D depending on seat height. Rolling walker folds to 20"D with back bar, 12"D without. Seat measures 15 3/4"W x 12"D.
Storage pouch is 15"W x 7"D x 6"H.
Weighs 16 1/2 lbs. ; tool-free assembly. Allow 2-3 weeks for delivery, no express shipping. A well built unit that would provide great mobility. I couldn't keep the produce because of it's size. I returned the item and it was received by Miles Kimbal on 8/25 and I am still wating to received the replacement rollabout which I ordered. Need a good outside walker for going on walks and going to pick up mail. Love pouch. Looks sturdy. I purchased one last month and it was too narrow . Hopefully, this will adapt to my body shape! The one I have now is not height adjustable and is a little to high for me to sit comfortably. I think this one will be better. Wider than others.....seat was wider. It looked sturdier. The extra strength, it's wider, adjustable seat height, and large wheels. Also, reasonably priced. It seems lighter than another one I was considering. I have yet to receive a problem with any product i have ordered. As my disability progresses, I'm able to find what I need. The website is easy to find such items. The wheel size works better outside. Looked and listed what I was looking for in a new walker. I just hope it is what was advertised. Who is the manufacturer in case of break downs or problems later and how do we contact them? BEST ANSWER: Thank you for your question. The maker is by Graham-Field Brand and their contact information is provide in with the instructions when you buy the Rollator. We hope this information will be of help to you. Purchased this Rollator a few months ago and need some support as to tightening the brakes and changing the wheels. The ones on it just slides on wet surfaces and won't stop when brakes are applied. There were no instructions of any kind in the box that it came in. How do I contact someone? How thick is the padded seat? BEST ANSWER: Thank you for your question. The seat is 1 1/4" thick. We hope this information will be of help to you. Can I change to the wide wheels on this rollator? BEST ANSWER: Thank you for your question. The wheels that this item comes with are 8 inches. We are unable to substitute any other wheels. We hope this information will be of help to you. my bottom is about 22" sitting down. will I be comfortable using this walker? BEST ANSWER: I find it very comfortable. I had no problem putting it together. I use it even in my home when I can't stand long. The basket is a good size, it halts all ny mail when I go to my mail box. There is a lot of room on this seat I have no problem with it I rate it very good. What is weight limit ? Is the height in this walker adjustable ? What is the lowest height. I am only 4'11. Bought a walker and lowest height was to high. Could not sit on it. BEST ANSWER: Thank you for your question. The seat is adjustable from 19.5" to 23.5". We hope this information will be of help to you. BEST ANSWER: Thank you for your question. 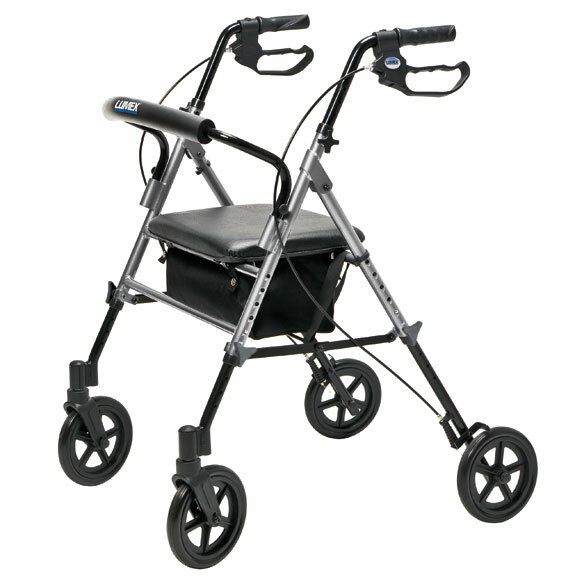 The Wide Height-Adjustable Rollator weighs 16 1/2" Lbs. We hope this information will be of help to you.